First off we apologise for being so quiet recently. Wifi hasn't been that great. We have been busy, ill and didn't realise our fan base had grown to such epic proportions that there is now a demand for this blog. We had best get cracking then. Woke up this morning to realise we had cocked up a train booking - luckily it was only a 2.50 train...it cost us more to sort though. w***. After,we made our way out the cockroach invested hotel (which Josh is very weird about - I didn't know that...haha he doesn't know I'm typing this) to BBD Bagh. Started off jumping on the wrong tram and then couldn't find the right bus so we just jumped in a taxi. Had our first weird run-in with the old bill! They pulled over the cab and got the driver out whilst they eye balled us from the truck. We starred straight ahead - proper hard man style. They drove off. Stone-cold; they knew not to mess haha. Weaved through the crazy maddness that is kolkata and dodged people crapping in the street to finally find bbd Bagh. We walked around a corner and found ourselves in the middle of a WWII film set, the name of the film is bomkesh bakshi for any of you that wanted to know, keep your eyes open for us in the background. We walked around some more crazy poverty areas (as you do when you're really clever) full of decrepid colonial architecture and little street stools. En route we sampled something called a pann. The pann is a mix of everything you basically would never put in your mouth, which has been wrapped into a dirty pann leaf (which was before washed in even dirtier water) by a filthy kid in some back alley that smells of sewage. As you can imagine it was vomtastic. It actually tasted like soap or shower gel - great for stopping kids from swearing. Eventually we made our way up to the train station and began our journey to Bodhgaya. After another very long sleeper train and fogy richshaw ride we reached our new destination. After finding a nice guest house we explored the vast array of temples. A huge mixture of them from a host of different nations - including the Mahabodhi temple; where grows the ancient bodhi tree. This was where buddha obtained enlightenment. Very spiritual. What we couldn't get over were the thousands of monks that had descended upon Bodhgaya - turns out we crossed paths with a big annual festival held here. Compared to kalkota its a very relaxed and spiritual place. Hot shower in the hostel. It was seriously needed. We went out for an early morning walk out of town and found a huge bridge that crosses a massive braded river bed. Must be enormous during the monsoon. The festival began with all buddist establishments putting on dance shows in a big tent. Totally spectacular - we were very lucky. Extremely heavy security, ten bombs exploded here last july. Oh dear. Somehow managed to get three fully grown men on a motorbike and headed out of Bodhgaya. We drove through some really poor agricultural areas and continued up to the mountains - here we found a small cave that also had strong connections with Buddha. After the cave we darted back down to another sacred spot and then we found the stupa where Buddha is meant to have pretented to be a tree god to get food (we think). Whilst there we had a quick walk around the local school for poor children. It was really impressive - it was nice to give a bit of money where you know it's going to make a real difference to somebody's life. Got their details to sort something out for them in the future. Went to restaurant, muhammad's, again tonight for about the 15th time (this isn't Josh's normal high level of exaggeration - we honestly smashed it). Eight portions of buffalo in three days. Ceremomy again tonight which Josh has fittingly named 'Gaya has got Talent'. A doctor monk then didn't like the look of Tom's eyes and didn't think much to his heart beat either. Consequently a full check up was obviously in order and a prescription of little honey ball things was given. Not gonna lie - it was a bit weird. 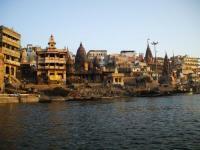 For those who don't know about Varanasi its one of the holiest cities for Hindus. 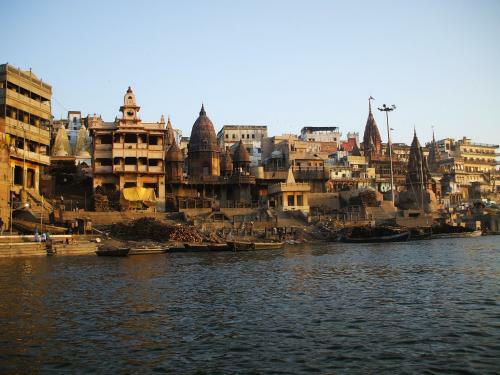 People travel here to cremate loved ones and brush the ashes into the river ganges. Very different from anything back home. The bodies are paraded through the streets in thin sheets and burnt in full sight at the riverside. Oddly not as shocking as we expected, particularly as 50-100 bodies are burnt a day. What was shocking were the wild dogs lunching on the charred scraps of human remains. Nobody was bothered in the slightest. Easily as many cows herw as people - they have won the streets here from the normally victorious richshaw drivers and dump as they please. Neither of us realised that all of the cows are owned by people. We have both become avid fans of the street goat - which has now started to don fashionable apparel such as t shirts and jumpers made from potato bags. It also great to watch them bully dogs and fight each other. A total write off. Both hurendous ill.
Woke up totally curred and continued exploring alomg the ghats. Got ourselves lost im the thousands of small shops that cram themselves into thw old city alley-ways. These shop merchants' favourite quarry is the white man, and they have a blood lust for rupees. Visted a terrible bakery which was recommended in the book. Took a boat ride I the afternoon to see the sun set over the buildings, silhouetting them over the ganges. Saw possibly the most gruesome sight. The watery corpse of a pregnant woman being shredded by a pack of dogs. Literally feet from the river front. It was something out of a horror film.